The John Birch Society is a notorious far-right nutcase group, founded in 1958 by a businessman named Robert Welch, whose trademark was paranoid and delusional conspiracy theories. In case you think that I am exaggerating unfairly when I use words like "paranoid" and "delusional," let me just mention that Robert Welch accused President Dwight D. Eisenhower of being "dedicated, conscious agent of the Communist conspiracy" (no, I'm not making that up). That captures the general style of their world-view. One might assume that the John Birch Society faded away decades ago, but no such luck. In fact, in February 2010 they hit the news as one one of the co-sponsors of the Conservative Political Action Conference (CPAC) in Washington DC. Now, in my opinion, a lot of the other CPAC participants, past and future, are already hard-right extremists only tenuously in contact with reality. But including the John Birch Society, no less, brought this tendency to the point of self-parody. But it so happens that one of the leading contenders for the Republican presidential nomination is an open and enthusiastic fan of the John Birch Society. As you can probably guess, I'm talking about Ron Paul, who was a keynote speaker at their 50th anniversary celebration—not back in the 1980s or 1990s, but in 2008. If you like, you can see his speech on video here. the repugnant newsletters that Paul published from the late 1970s until the mid-1990s, which contain a raft of bigoted statements. Paul has denied authorship and implausibly claims not to know who wrote them. In light of the newsletters and his current rhetoric, it is no wonder that Paul has attracted not just prominent racists, but seemingly every conspiracy theorist in America. [....] As Paul told The Times last week, he has no interest in dissuading the various extremists from backing his campaign, which is hardly surprising considering he’s spent three decades cultivating their support. Paul’s shady associations are hardly “bygone” and the “facts” of his dangerous conspiracy-mongering are very much “in evidence.” Paul has not just marinated in a stew of far-right paranoia; he is one of the chefs. I know that some otherwise intelligent and well-intentioned people (I am too polite to mention names, but they know who they are) have resisted acknowledging the undeniable fact that Ron Paul is not just a poisonously reactionary political troglodyte but an out-and-out crackpot. But they should try to face reality. The fact that a number of the other Republican candidates are also dangerous loons is not a good excuse for giving Ron Paul a free pass. And the fact that one might find some of his specific positions, or some of his pseudo-"libertarian" rhetoric, sympathetic is not a good enough excuse either. Meanwhile, for those of you to whom this information about Ron Paul is news, I recommend reading Kirchik's latest piece in full (below). But this is the tip of the iceberg. 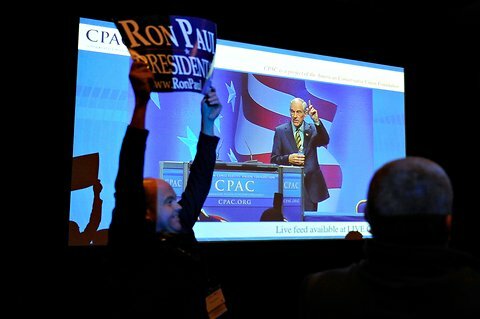 Jonathan Ernst/Reuters Ron Paul at the Conservative Political Action Conference in Washington on Feb. 11, 2011.